Outside of paid performers such as athletes, actors and presidential candidates, there aren’t too many professions where booing is the cost of doing the job. Sure message boards can be a nasty place to venture if your a sports radio host or a play-by-play guy for the local nine. But there’s no tone to the printed screed. There’s no way to tell if a fan is booing the radio or yelling at the TV while the broadcaster is talking. He’s unaware. It’s the same for newspaper writers. We don’t have to be there when they crumple the paper or curse the byline — unless it happens at the coffee shop when the person doesn’t know you’re sitting two seats away. (Long story.) That blissful ignorance ends when you step on stage. Back at the 2007 Winter Warm-up, a friend, one of those broadcasters, invited me up on the main stage to, I have to imagine, kill time before someone interesting walked by. Being there didn’t get me booed. Saying something did. Like this year, the Cardinals came into that Warm-up as World Series champions, and with Albert Pujols signing autographs about 20 yards away from the main stage the place was packed with Cardinals Nation. Pujols was the reason I received boos. My friend put me in position to defend Ryan Howard receiving the National League MVP. It was a close vote, and Pujols finished second. By many measures, Pujols deserved the award. He had far better rates than Howard — batting .331 to Howard’s .313, slugging .671 to Howard’s .659 and reaching base at a .431 clip to Howard’s .425. Howard had the edge in counting stats (58 homers, 149 RBIs to 49 homers, 137 RBIs), but was way behind in advanced stats such as WAR (8.3 for Pujols to Howard’s 5.8). When it came to less tangible MVP qualities, Pujols had the playoff-bound team, Howard didn’t. Chase Utley, a teammate of Howard’s, finished seventh in the MVP voting. No other Cardinals position player received an MVP vote. In short, I was swimming against the tide and playing against the room. I knew this, but also felt like we couldn’t cater to the crowd by so easily dismissing Howard’s qualifications because Pujols was sitting 60 feet away. Howard did have nearly 60 home runs. He hit .385 in September, had 41 RBIs in August, and such a strong finish was fresh on the voters’ minds. So, that’s what I said. The boos wasted no time drowning out anything else I could add. My stomach filled with molten lead. The interview continued. I’m sure I said something complimentary about the team, about the first baseman, about whatever. It didn’t matter. I was booed one final time as I stepped off the stage. Later, Pujols remarked: “Oh, I heard.” I don’t know if he meant the crowd reaction or the comment that inspired it. I stand by the latter. I was, honestly, slightly unnerved by the former. Getting booed was new, unusual. It wasn’t unpleasant. It just wasn’t something I ever expected in this position. You don’t expect people to care enough to boo. Write an anonymous Twitter that questions your right to procreate? Fine. Expected. Almost cliche. But boo? I mean that takes effort. So it was with some trepidation that I took the stage this afternoon again the Winter Warm-up, again in the wake of a World Series championship, and again in front of a large crowd. 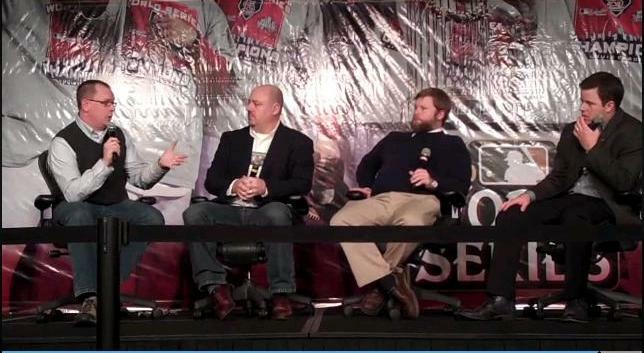 From right to left: Tom Ackerman (KMOX), Matthew Leach (MLB.com), Brian Stull (WXOS/101.1 FM) and me at a 2012 Winter Warm-up writers panel. There was a moment when I thought it was going to happen again. One of the other members of the panel had compared Cardinals catcher Yadier Molina to Cincinnati Reds great and Hall of Fame catcher Johnny Bench. He was quoting others, but it was a comparison that didn’t hold, any more than if I had made the claim that neither Pujols or Howard deserved the MVP in 2006 when there was this lefty specialist out of San Francisco to consider. Two of us took issue with the comparison. If there was going to be a rumble from the crowd, this was the time. But the crowd, for the most part, nodded. Maybe it was because the majority agreed. Maybe it was because there were other panelists up there to deflect attention. Maybe it’s because Molina wasn’t sitting in the same room and the crowd didn’t feel the need to rally in support against the evil scribes. Whatever the case, I went up on the stage ready this time, braced even, and the moment came and went. This time they didn’t boo. That said, I’ve yet to check Twitter tonight. This entry was posted in baseball, journal, journalism, newspapers, project 365+ and tagged albert pujols, cardinals, johnny bench, st louis cardinals, winter warmup, yadier molina by dgoold. Bookmark the permalink.